Sanrio are the company best known for bringing the world Hello Kitty, but they also have dozens of other characters. And not all of them are quite as sugary sweet as their biggest brand. 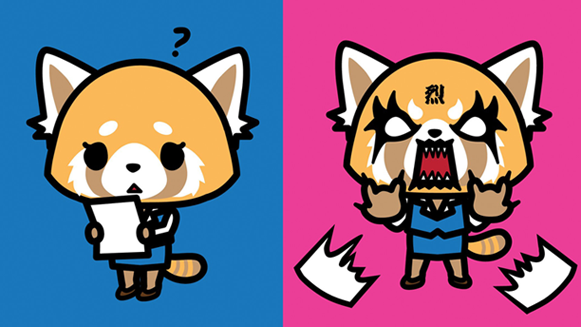 On first glance Red Panda Aggretsuko looks like she should be another cutsie mascot. However, the fact that her name is short for Agressive Retsuko may be a clue that all is not as it seems. This is a Sanrio series that is clearly aimed at adults. Retsuko is a 25-year old Red Panda who works in the accounts department at her dream company, who finds that her superiors and co-workers keep piling on more and more impossible tasks. To let off steam she has an unusal hobby.. singing death metal at a karaoke bar. Aggretsuko will be coming to Netflix in spring next year in the form of 15-minute episodes. The new trailer promises a series that will take the cute Sanrio style and add an unexpected twist. The Netflix series will follow Aggretsuko's debut in a series of shorts that began airing in Japan as part of a magazine show named O-sama no Brunch in 2016. The new series will be written and directed by Rareko. Fanworks is the production studio responsible. Check out the trailer below and let us know what you think in the comments or via our usual social media channels.